To the citizens of the United Kingdom. To their political representatives. We want to motivate our fellow citizens in the United Kingdom to reconsider their decision to leave the European Union by organising a new referendum. A few days before the long-awaited decision, so much dreaded, I write this letter of friendship and love, at this period where the weather begins to soften and trees wake up from their winter torpor to prepare for this season where all hopes, all dreams are allowed, with its emotions and its perfumes of hope. Our fields will soon be covered with all shades of green and our cities dotted with flowers of multiple colours. A mixture of colours in the image of this Europe so hated, so beloved, which we need so much ... Europe you are the continent that welcomes me, who teaches me, who tolerates me, who rocks me, who protects me…. Did I wait too long to tell you, my English friend, to stay with us, to tell you that we love you and that we need you? Too late for you to return to us Europeans, you, the disappointed European. We know that the European Union needs reform, everyone is clamouring it ... But the European Union is us, it's you, it's us all; federal or not, we need it. We must continue to work, to live together, one with the others, and not one against the others. Let's transform together mistrust into trust, dispute into debate, conflict into agreement, tension in relaxation, speech in action, let's do it for your children, for our children ... Let's forge with our contradictions and our differences our specificity, our common identity. The European Union is not an international organization, but an extraordinary community of values! It defends equality, pluralism, non-discrimination, tolerance, justice, solidarity, freedom. Let's be proud to share and defend these same values. All different, all European, this is what the whole world envy us and that we must preserve for future generations. As we all know, the European Union is far from perfect, but Europe is an extraordinary space of play, diversity, creativity, friendship and peace. And do not be fooled, Peace is in danger. Let us stand together against extremism, intolerance, racism, fanaticism ... nationalism. Let us be aware, be responsible and determined to prevent another conflict that would certainly be more devastating than the previous ones, let's vote for the men and women politicians who speak to us of dialogue, meeting, sharing and peace ... it is not only essential but above all, it's possible! You arrived late in this Union project that we already shared with others, you were at the same time the brake and the engine of the European Union, often sceptical, sometimes critical, always inventive and creative, worker and constructive, you have helped to do better, tirelessly present, often precursor .... With your deeply democratic, political culture, you are an indispensable part, necessary for the construction of the Union. The sun sets and the winter freshness takes the evening in its arms. After a moment of hope and optimism, my body and my ideas are getting colder ... Is it possible to change the course of history? In the past, the conviction and endurance of many men and women have enabled us to live better today. Let us follow their example, let's not lose the vision of a better future for all, better for us, and with you, better for the world. I have been rewriting this letter for weeks. At times it was too long, sometimes too political, too institutional, too administrative, too simplistic, too naive, utopian perhaps ... but how write it? Did I find the right words, did I know how to convey to you my true desire, did I convince you? Wake up, get out, get out of this nightmare in which we are entangled ... Stay with us, come back, claim a new referendum. Raise your voice, let know that we are all Europeans, you and I, you and us, we with you, all together. Let's return the colours of our fields to Europe, the colours of hope and shared joy. My friend, the Englishman and -women, my friends from the United Kingdom, I love you. Brexit, with a deal will be a fracture. Brexit without a deal will be an earthquake which will leave no one unharmed. On the economic front, hundreds of thousands of large companies, but especially small ones, will be affected on both sides, endangering thousands of jobs. At the human level it will be dramatic, many members of our families live in the United Kingdom and many UK citizens have family or live themselves in Europe. If the United Kingdom leaves the European project that we have woven together for decades it can only be harmful for Europe and its people. Our politicians cannot interfere in what is the choice of a sovereign people. But we can dare call for a renewal of the referendum. We citizens, we must speak to our fellow-citizens across the Channel, express our affection for them, and ask them to not to leave Europe, but call them back to us. Let's all sign a declaration of friendship, only a massive call from citizen to citizen can reason decision makers. We are stronger and better together, economically, politically, socially and culturally and scientifically. The economical benefits are direct and measurable but more importantly the human exchange the strengthening of science, art and cultural exchange greatly surpass merely monetary measures and are priceless. Allow for our exchange to continue for all of our benefits for a better future. I eant the best for the British citizens. I have worked intensively with scientists from the UK. We had a great collaboration, Many are still my friends. I , we, believe in international cooperation. The EU has its failts, but lets work on these together. I am comvinced that cooperation in the EU benefits all. Brexit, with a deal will be a fracture. Brexit without a deal will be an earthquake which will leave no one unharmed. We citizens, we must speak to our fellow-citizens across the Channel, express our affection for them, and ask them to not to leave Europe. Let's all sign a declaration of friendship, only a massive call from citizen to citizen can drive the change of this decision. Hi, Will you join me in making Europe a better place? I have just signed a petition 'Letter to fellow citizens of the United Kingdom - Call for citizen solidarity in Europe'. This is an issue I really care about. Will you sign it too? 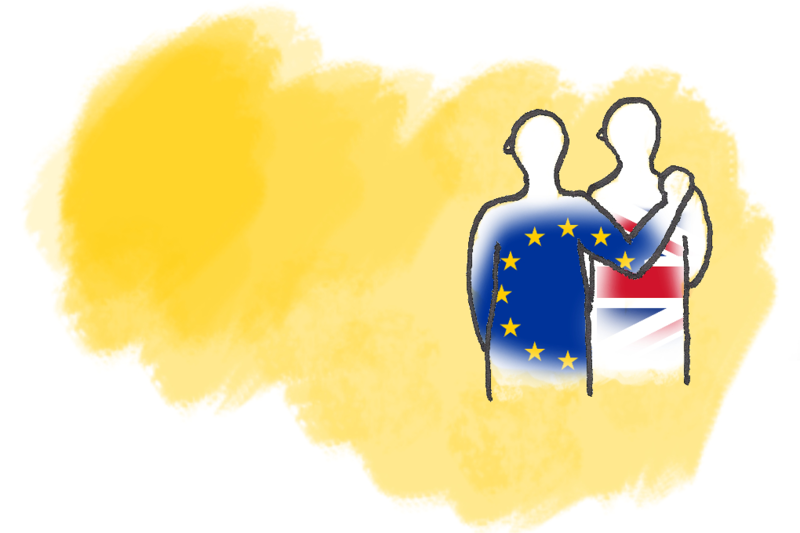 https://you.wemove.eu/campaigns/letter-to-fellow-citizens-of-the-united-kingdom-call-for-citizen-solidarity-in-europe Thank you!